Weekly Photo Challenge: Juxtaposition | Oh, the Places We See . . . This week’s WordPress Weekly Photo Challenge: Juxtaposition: Wandering with my camera, I often find my eye drawn to strange bedfellows. Juxtapositions. Foils. Unexpected pairings. Listening to all those stories can wear a Santa out! Well, take a break, guys! 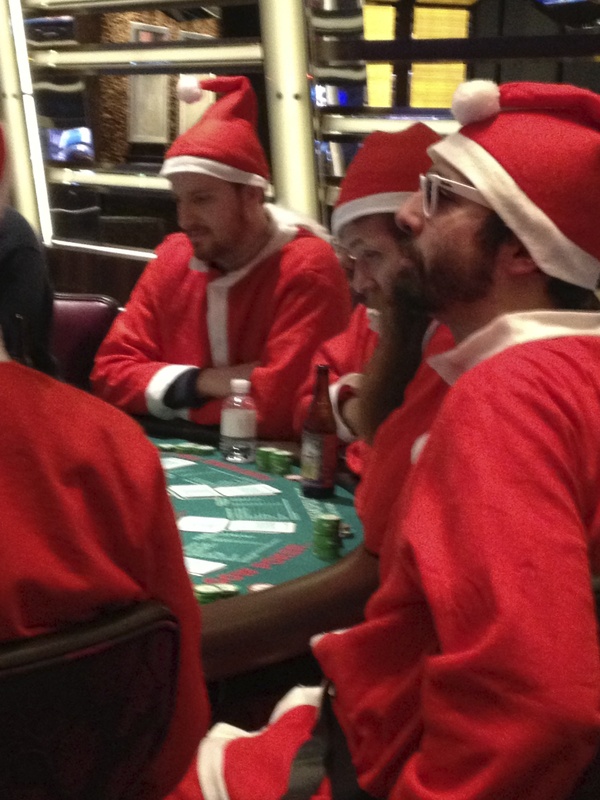 Like a table of Santas gambling in Vegas, perhaps? So those normally on the giving end are hoping for a little take on the side? It could happen! This entry was posted in Photography, Weekly Photo Challenge and tagged Las Vegas, postaday, Santa, Weekly Photo Challenge. Bookmark the permalink. That’s a fantastic one! You just don’t see a lot of Santas together every day. Thanks! It was a double-take for me!!! Ya just never know! Thanks for checking in to see my pics! So true!!! And they seemed to be enjoying it!